Previous studies have reported associations between levels of protein and carbohydrate intake with several health outcomes. Yet, their effect on successful (or healthy) aging remains unknown. The purpose of the present work was to investigate the association of protein and carbohydrate intake levels with successful aging. A cross-sectional analysis was carried out on the participants of two epidemiological studies; the ATTICA and the MEDIS studies. Anthropometrical, clinical and socio-demographic characteristics, dietary habits, and lifestyle parameters were derived through standard procedures. Successful aging was evaluated using a validated index (SAI) composed of 10 health-related social, lifestyle and clinical characteristics. SAI levels were lower in low protein—high carbohydrate diet group (B = − 0.08, p = 0.04), but higher in high protein—high carbohydrate group (B = 0.06, p = 0.04), as compared to low protein and low carbohydrate diet, in participants living in insular areas. 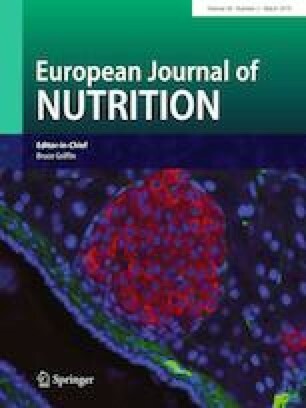 Protein—carbohydrate diet was not associated with SAI (all p’s > 0.05) among participants living in urban areas (p for diet—study interaction < 0.001). A high protein diet seems to be beneficial for older islanders in terms of successful aging; stating a hypothesis for a potential diet–environmental interaction that may be related to the quality of foods consumed and, consequently the sources of nutrients. Authors are particularly grateful to the men and women from all areas that participated in the ATTICA and MEDIS studies. Also, author would like to acknowledge the contribution of the MEDIS study group: E. Polychronopoulos, M. Tornaritis, A. Polystipioti, M. Economou, (field investigators from Cyprus), A. Zeimbekis, K. Gelastopoulou, I. Vlachou (field investigator from Lesvos), C. Lionis, I. Tsiligianni, M. Antonopoulou, N. Tsakountakis, K. Makri (field investigators from Crete), E. Niforatou, V. Alpentzou, M. Voutsadaki, M. Galiatsatos (field investigators from Cephalonia), K. Voutsa, E. Lioliou, M. Miheli (field investigator from Corfu), S. Tyrovolas, G. Pounis, A. Katsarou, E. Papavenetiou, E. Apostolidou, G. Papavassiliou, P. Stravopodis (field investigators from Zakynthos), E. Tourloukis, V. Bountziouka, A. Aggelopoulou, K. Kaldaridou, E. Qira, (field investigators from Syros and Naxos), D. Tyrovola (field investigator from Kassos), I. Protopappa (field investigator from Ikaria), C. Prekas, O. Blaserou, K.D. Balafouti (field investigators from Salamina), S. Ioakeimidi (field investigators from Rhodes and Karpathos), A. Foscolou (field investigator from Tinos), A. Mariolis, E. Petropoulou, A. Kalogerakou, K. Kalogerakou (field investigators from Mani), A. Foscolou, K. Katsana, P. Drepanidis, S. Iosifidis (field investigators from Spetses), A. Foscolou, K. Gkouvas, K. Katsana, (field investigators from Aegina), A. Foscolou, K. Gkouvas, K. Katsas, P. Kaloudi, E. Papachristou, A. Stamouli (field investigators from Paros) S. Piscopo (field investigators from Malta), J.A. Tur (field investigators from Mallorca and Menorca), G. Valacchi, (B. Nanou (field investigators from Sardinia and Sicily), A. Foscolou, E. Paka, P. Drepanidis (field investigators from Gökçeada) for their substantial assistance in the enrolment of the participants. Authors would like to thank the ATTICA study group investigators: Y. Skoumas, N. Katinioti, L. Papadimitriou, C. Masoura, S. Vellas, Y. Lentzas, M. Kambaxis, K. Paliou, V. Metaxa, N. Skourlis, C. Papanikolaou, A. Kalogeropoulou, E. Pitaraki, A. Laskaris, M. Hatzigeorgiou, A. Grekas, E. Kokkou, E. Georgousopoulou, for either assistance in the initial physical examination, as well as laboratory team: C. Vassiliadou and G. Dedousis (genetic analysis), M. Toutouza-Giotsa, C. Tselika and S. Poulopouloou (biochemical analysis) and M. Toutouza for the database management. The ATTICA study is supported by research grants from the Hellenic Cardiology Society (HCS2002) and the Hellenic Atherosclerosis Society (HAS2003). The MEDIS study was funded by Research grants from the Hellenic Heart Foundation, the Graduate Program of the Department of Nutrition & Dietetics, Harokopio University and the Rutgers University, NJ, USA (GA #5884). Stefanos Tyrovolas was supported by the Foundation for Education and European Culture (IPEP), the Sara Borrell postdoctoral program [reference no. CD15/00019 from the Instituto de Salud Carlos III (ISCIII—Spain) and the Fondos Europeo de Desarrollo Regional (FEDER)]. Demosthenes Panagiotakos and Stefano Tyrovolas have been funded for ATHLOS project to study trajectories of healthy aging (European Union’s Horizon 2020 research and innovation program, Grant Agreement no. 635316).